If you've been following Minnette's book tour this month you'll know she takes her historical research very seriously, then adds a dash of delightfully believable imagination to create great stories. Tomorrow she'll be visiting my blog to give you a glimpse into what she's learned of the history of London. I've already seen her post, and you really shouldn't miss it, some really fascinating facts and intriguing details... Minnette will be ready to answer your questions too, so don't forget to leave comments. Somewhere between thirty and dust...red hair, blue eyes...six kids, one slightly used husband, and any number of pets from time to time... wanttabe hippy... wanttheirmoney yuppie...pro musician and actress for 20 Years... native Oregonian... lover of music, beauty, and all things green. Willing slave to the venerable muse. Minnette currently resides in Portland, Oregon with her husband, having replaced the children with one dog. The dog, Pierre, pretty much runs the show. 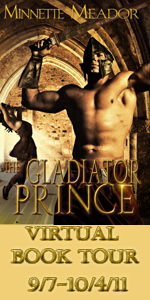 Can't wait to know more about "The Gladiator Prince" ! I love reading historical romances...but I usually swoon with the amount of research the author puts in!! She does take her historical research very seriously. It is appreciated. Are you a member of the Santa Club?